Having trouble with your Cuckoo Clock? Learn how to fix them. 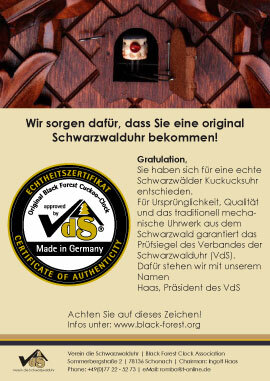 That's why we developed a certificate of authenticity for clocks produced in the Black Forest area with a mechanical clockwork. We want to give you a helping hand in decision-making. The members of the Black Forest Clock Association are producers, traders and experts that want to preserve the high quality standart of Black Forest clocks. We provide a list of original Black Forest Clock shops as well as international service stations for clock repairs in your country/area. For frequently asked questions see our Clock information and help section. We take care you get a genuine Black Forest Clock!